The first thing that struck me was the lovingly maintained landscaping. The resort is a riot of greenery, making each path a quaint boulevard ringing with the chirping and cooing of birds. At a counter in the lobby, you can rent a bicycle and start pedaling down the paved paths that snake through the island; it�s a good workout that would leave you revitalized. However, I chose to walk. The boulevard felt almost like a tunnel at certain points, especially where bougainvillea arched over my head, through which the sun splintering into a million little drops of gold that showered over me as I strolled along. It was because of this delightful shade that it was not surprising to me when I came across the rose garden. Often rose is hard to maintain in the Maldives because of the relentless sunshine, but here there was just the right amount of sun and shade for them to thrive. The flowers were in full bloom and the sight was basically therapy for the eyes. Speaking of therapy, the resort�s Araamu Spa was a delight to discover as well. The area feels truly like a small Ayurveda village, lulling relaxation from the moment I stepped in thanks to the sound of flowing water. There are more than a dozen private rooms where an assortment of treatments can be enjoyed, all of which are hundred percent natural and derived from ancient herbal practices of India, Sri Lanka, and the Maldives. The spa houses a steam room as well. The crowning glory of my walk through the island was Zero. Zero is an area on Sun Island where farming and hydroponics have have come together to create a garden where you could literally get a fresh meal just by plucking leaves here and there. Salad greens, banana, tapioca, herbs� you name it, it�s there. 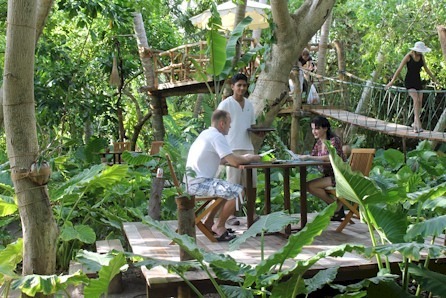 There is a quaint roped bridge leading up to a tree-house spot where a meal can be enjoyed. There�s also a stand for the chef who whips up an organic meal in a few minutes. Zero is testament to the nurturing relationship Sun Island has with nature. Nature lovers like myself have more to look forward to in addition to walks through the island. The lagoon is picture perfect and invites schools of fish that dart around under the turquoise surface in an entrancing dance, a perfect show for snorkelers.�Shark�pups are many, and they hurry to the pier area on the island at sundown to join in on stingray feeding time. I made it there when the feeding was well underway, and was rewarded to the sight of a congregation of sting rays circling around a man up to his ankles in the water. Every time he threw a scrap of meat into the sea, the marine animals surged over it in a fantastic show of speed and strength. Shark pups swam around competitively, pecking at any morsel that happened to float away unnoticed. Larger sharks are fed at the opposite end of the island at the same time, and there reef sharks and nurse sharks would be begging for treats. At night when most of the island slept, I took a walk along the beach, an expanse of powdery white sand speckled with milk crabs scuttling this way and that under the silver light of the moon. The skies were decorated with the scintillating constellations while wavelets played around my feet. It would take three hours to walk around the island at the speed I was going, and it was tiring, so I contented myself to resting at the beachside coffee shop that�s open 24/7. Beyond the coffee shop and lobby is a pool as large as it is beautiful, especially when lit up at night, the water incandescent and serene. Not far away music belted out from the discotheque. At weekends there�d be cultural shows there as well, but I would be leaving without getting to check that out. In the area of the discotheque the beach seems endless, like a sandy sea, and I walked forever before coming up to the shore bathed only in the glow of the moon. After a glorious sunrise, I devoted the next day to hunting out the excitements Sun Island Resort and Spa had on offer. While I�d seen the discotheque the night before, I�d failed to notice the beach bar just a few steps away. It was impressive. Sprawling along before spilling out onto the beach and the enormous 1,800 square meter pool that the night before had been iridescent, the bar is spacious and seating is well spaced out. The choices of cuisine and drinks are many. I was sure that even if I stayed two weeks it wouldn�t bore me to frequent this area. The two fountains at the ends of the pool made a soothing music as I sank into the plush cushions and enjoyed the beach view. Not far away is the water sports zone. There I found activities ranging from catamaran rides to windsurfing. Canoeing, jet skiing, water skiing, and knee boarding were among the many options as well. The area is so huge that the management has started a small farm in the vicinity as well, to complement work done at Zero. A short walk away in the lobby complex I found an array of activities on offer; you can play billiard, tennis, badminton, darts, squash, and volleyball among various other sports. There is a game room where the kids will definitely go nuts over computer and arcade games, as well as exciting rides and toys galore. The recreational center also includes an area where guests checking out early and have a few hours to kill can still utilize the remaining time of their vacation to the fullest. There�s a gym, aerobics center, and a steam bath for pre-travel relaxation. In the adjoining garden you can lounge in Jacuzzi�s or take a dip in the steaming �Chill Pond�, or sit at garden tables and sip cocktails while reading a book. While Sun Island Resort and Spa is fully capable of entertaining its guests on the island alone, it offers several excursions to explore Maldives fully. Guests can sign up for�fishing trips�and�snorkeling�trips. Cruise or adventure trips will reward you to the sight of dolphins arcing over the water and terns feeding on schools of tiny fish skimming the surface of the ocean. There are island trip excursions for those who would like a peek into the laidback rural communities of the inhabited islands nearby. Divers need not worry; Sun Island Resort and Spa is not far from one of the best diving locations in the atoll, and years of the management�s nurturing of the environment have made the area a favorite for both small and large aquatic fauna. The resort�s love for the marine ecosystem of Maldives was proven when it established a Faculty for Marine Studies on the island. The faculty monitors marine flora and fauna, and ensures turtles, stingrays, and shark populations thrive to avoid a collapse of the surrounding marine ecosystems. I also discovered that the faculty relayed information to guests about stingrays and sharks before feeding time commenced at sunset every day. Sun Island Resort and Spa is, without a doubt, a place where everyone can find a niche to enjoy. While my friends who love excitement and adventure were sated, so too was I with my love for tranquility and isolation. By attracting guests to its various points of interest and �sun activities�, the resort never feels congested and never fails to satisfy. Besides, Sun Island�s�accommodation options�are a dream come true in itself!